Ever since we’ve moved to our new house last May, I have found myself pretty content with the furniture we have in our main living area. Of course, it is always subject to change should a more perfect and reasonably priced piece present itself. However, I feel the overall flow works in style, color, and family friendliness. 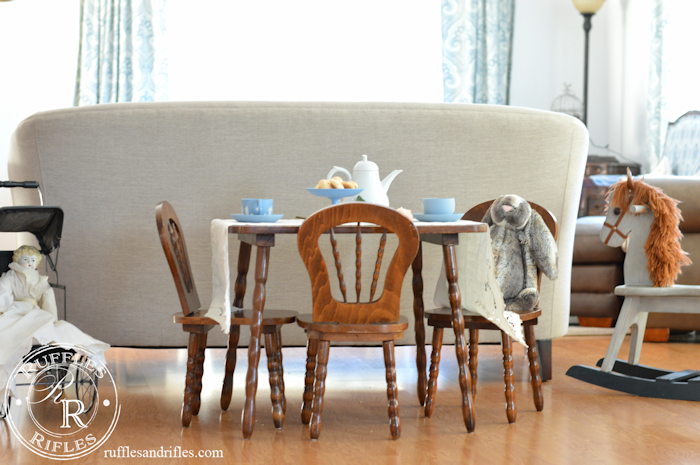 The one exception I had was the children’s table and chairs we had which sat in between the dining table and living room. It wasn’t horrible by any means. When my mom gave it to my boys 7 years ago at Christmas, it was undoubtedly the nicest piece of furniture we had at the time. My husband and I actually laughed about that. That little set of table and chairs has been used and used everyday. However, the little animals and green and brown color scheme although they didn’t clash, weren’t what I envisioned. 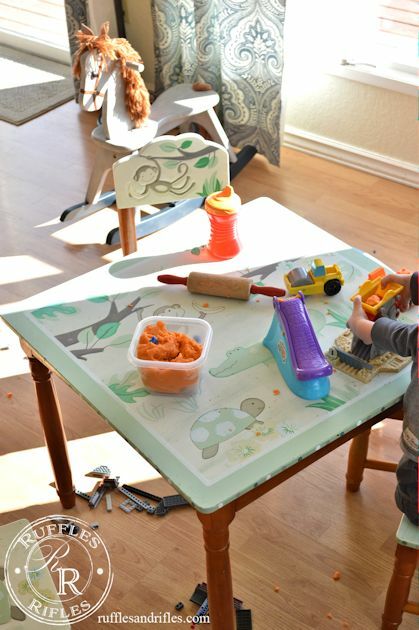 The table’s paint is wearing away in many areas. It has been very well loved. So I have been keeping my eyes out for a different little set. One that was a little more classic, wood, and maybe even vintage. A couple weeks ago I was having one of those January days. It was dark and I knew more coffee wouldn’t help. There were those discouraging lies I was trying to throttle with truth. I knew I should just get some things at home accomplished, but I kept feeling this nudge to go to my favorite thrift store. You may think I always have a nudge to go there, however, I’ve only experienced it one other time. Every other time I just want to go. So I bundled up my two youngest, and there upon arrival, I saw what had been calling my name. 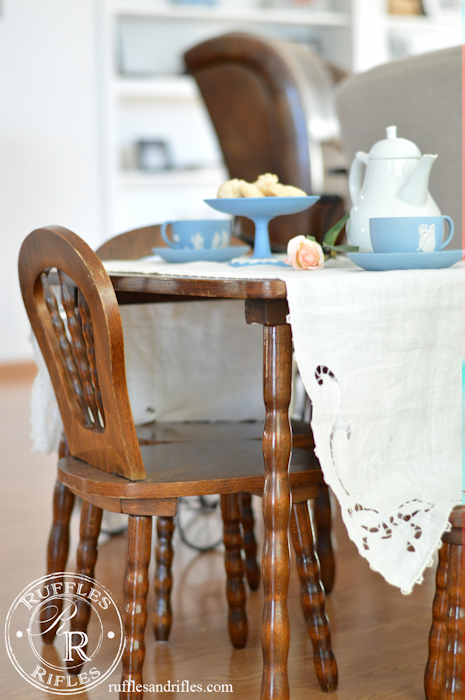 The sweetest little vintage table and chairs. There were only three chairs, but I figured, since it normally sits against the wall anyhow, that wouldn’t be a problem. 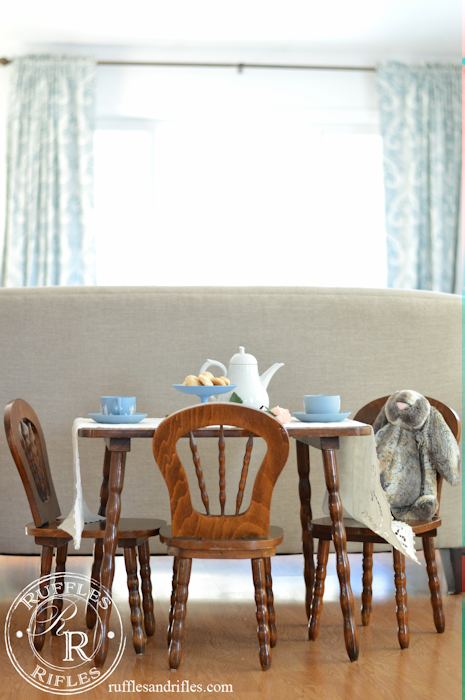 When we have more kids over we could always borrow a chair from the old set, which would make its new home in the little boys’ room. 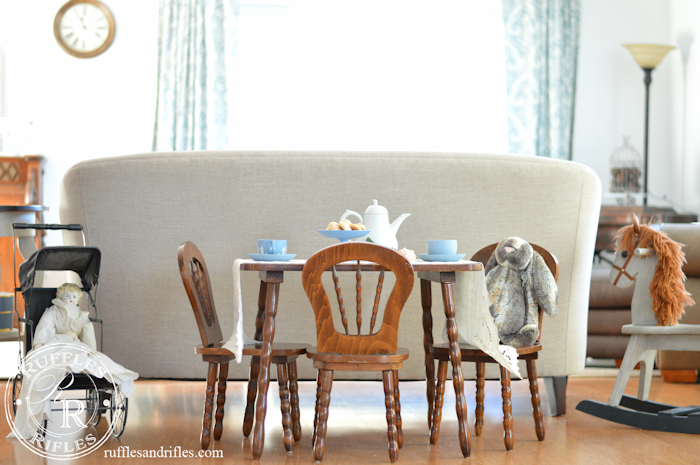 So I brought the little table and chairs home, and started imagining the table not just used for playdough, and coloring, and peanut butter sandwiches, but pretty little tea parties. I have a daughter now. And the things I used to think wouldn’t ever happen are becoming a reality. 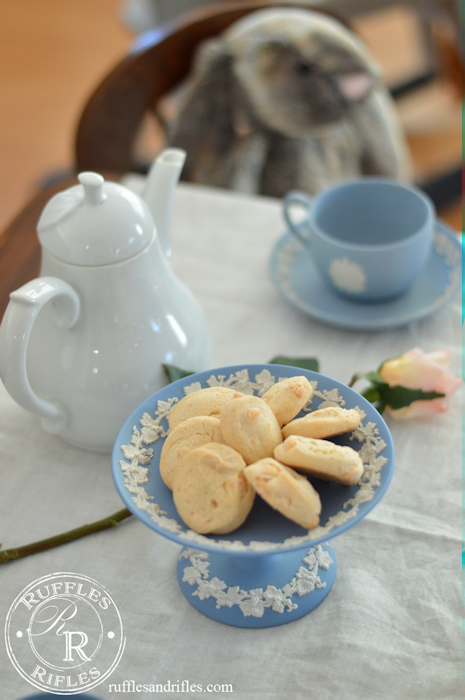 I styled that little table like a tea party with my beloved Wedgewood. 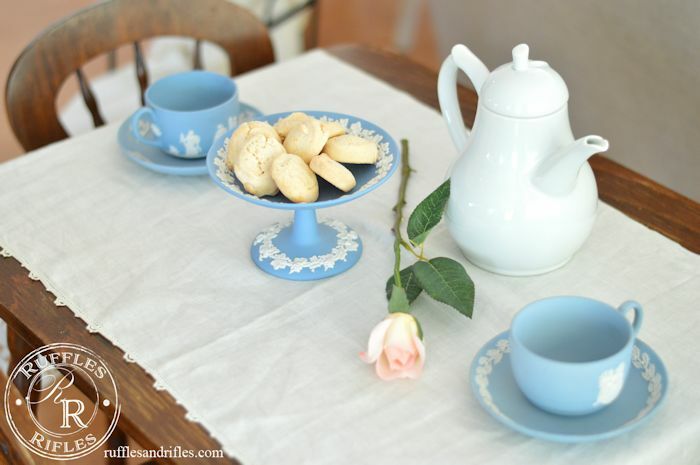 Did you know of all the dishes in the world, Wedgewood is my favorite? I don’t have a lot, it’s hard to find in Alaska. My mom picked me up a couple pieces years ago while in England, and I found that sweet little pedestal candy dish a couple months ago at my favorite thrift store. 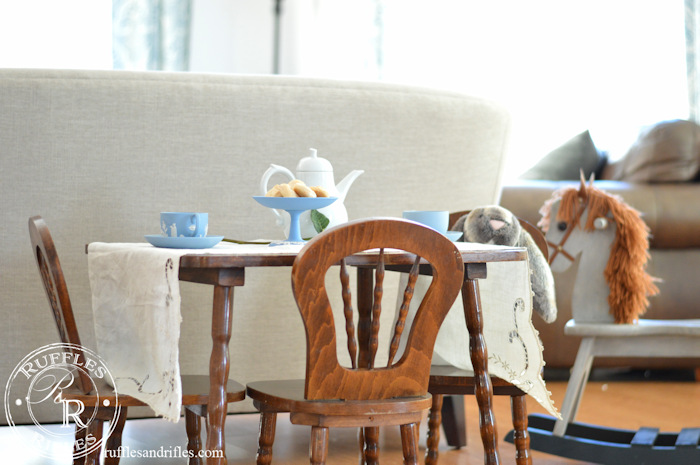 The antique porcelain doll sitting in my great-grandma’s doll carriage and my daughter’s velveteen rabbit waiting for tea, started to remind me of the all the charm of Beatrix Potter’s tales. 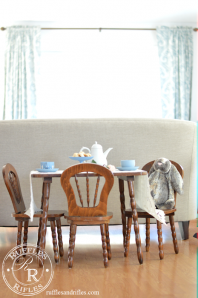 Aren’t the legs on the table and chairs the sweetest? I love the wood. 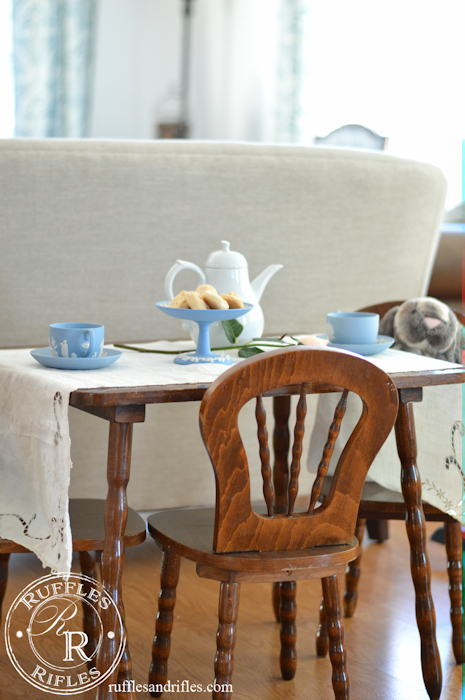 However, I am tossing around the idea of perhaps painting the table legs, and the legs and backs of the chairs a creamy farmhouse white, maybe with a tiny bit of crackle? There’s just a lot of brown in our living area (see here for more pictures); a brown leather couch and two large chairs, and antique organ and treadle, and I don’t want the room to be heavy. What are your thoughts? I love it! Yes, painting it would be good too! Thank you so much Linda! I am loving it too! Such a beautiful little set! My thought is not to paint. My husband is a carpenter and he cries at the thought of painting wood (not literally)! In any case, why not live with it as is for a while? Another perspective, do you want it to look antique or up-to-date? Christine, thank you so much for your input. I know, I love how pretty the wood is, so honestly I’m leaning towards not painting it. I think the dark-dark Alaskan January has me craving white and light. We shall see though… But I get the “crying” over painting beautiful wood. I feel that way when people paint upholstery, and sometimes wood too. Some changes are pretty hard to ever bring back. Beautiful! I love this, God is so good! 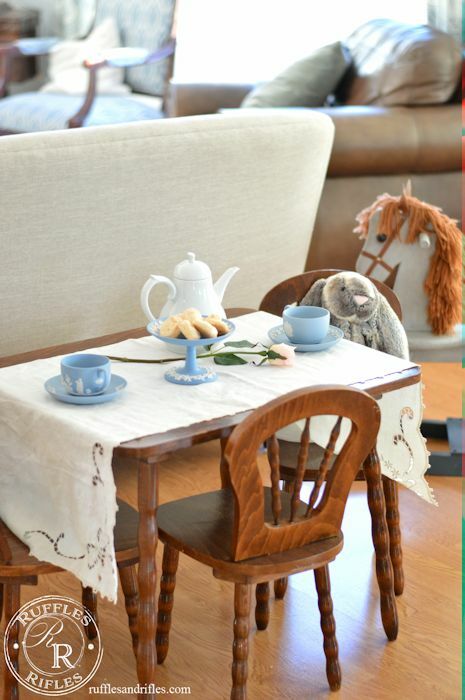 The table is adorable! It ADORABLE!!! So glad you were “kissed!” Which is your favorite thrift store?? Thank you Claudia! 🙂 Thrifter’s Rock, I love the creativity, and the cleanliness there! And coming up this weekend they have a Wasilla location as well. Fun, fun! Thank you. I’m excited too. 🙂 I’ve waited a LONG time! And, I’m liking the wood a lot too. It’ll most likely stay that way.